Heat vegetable oil in deep frying pot. 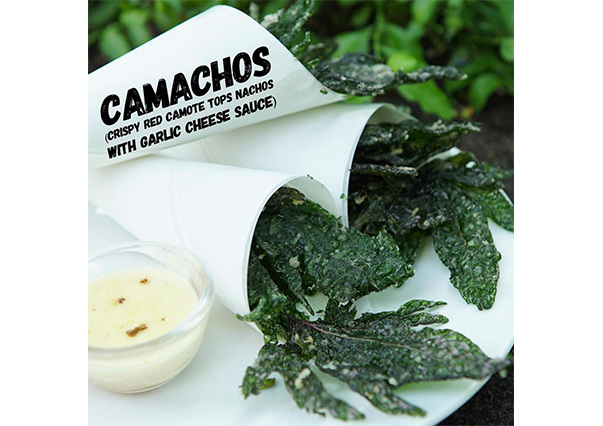 Transfer the camote leaves in dry cornstarch powder seasoned with seaweed salt then dip lightly in the batter mixture. Deep fry to a crisp and drain excess oil in paper towels. Make the cheese sauce: in a non-stick pan melt margarine over low heat and sauté grated garlic. Add flour, this will serve as your roux. Then toss in milk and then add grated cheese. Simmer over low heat until it you reach a thicker consistency.